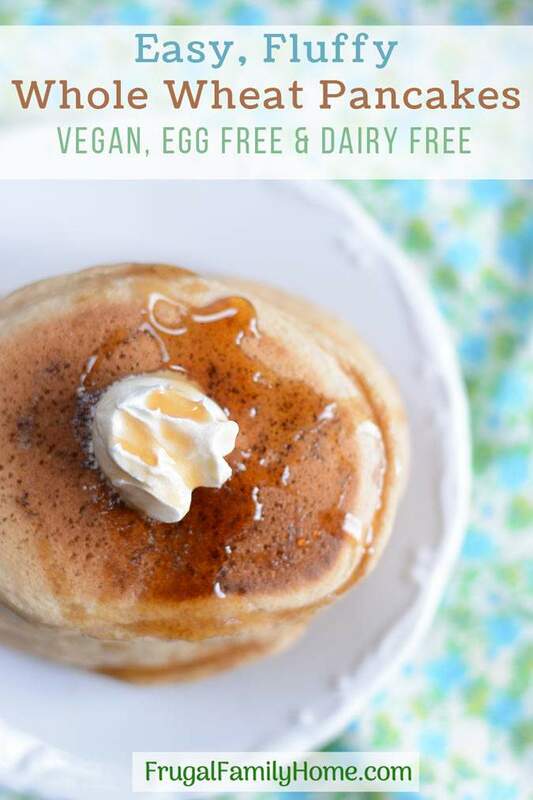 Pancakes are a great breakfast option and if you are trying to eat healthier these easy whole wheat pancakes are great to try. I use a specific flour to make sure they are light and fluffy instead of heavy and dense. Pancakes are a weekend staple at our house. We have pancakes at least 2-3 times a month. They are super easy to make and so delicious. The basic pancake recipe I use is great, but if you are trying to get more whole grains in your diet. If you are trying to eat healthier and cut back on white flour, you need to try these healthy pancakes from scratch. They are super easy. 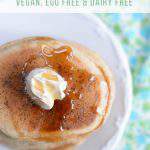 These fluffy whole wheat pancakes are made without eggs and can be made dairy free too. These easy whole wheat pancakes are also Weight Watcher’s friendly at only 3 SmartPoints per serving. With only 5 ingredients needed and in about 10 minutes you can enjoy fluffy whole wheat pancakes in no time. Some of the links in this post are my referral links. That means when you make a purchase through the links I can make a little money at no extra cost to you. Thanks! See my disclosure policy for more information. For milk you can use any kind of milk you like or juice if you don’t have milk. I’ve tried it with soy milk, grape juice, and apple juice too. The grape juice makes the pancakes purple but they taste great with any of these options. The flour you use makes a difference. You don’t want regular whole wheat flour, but instead you want to use whole wheat pastry flour. 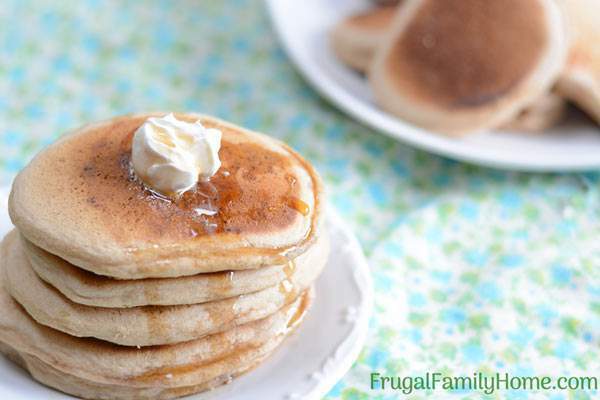 The whole wheat pastry flour helps to keep the pancakes light and fluffy and not heavy. Even though this is a simple and easy recipe to make, watching it be made is helpful. If watching a video isn’t your thing, keep on scrolling down for tips and the printable recipe. And the cost breakdown too. 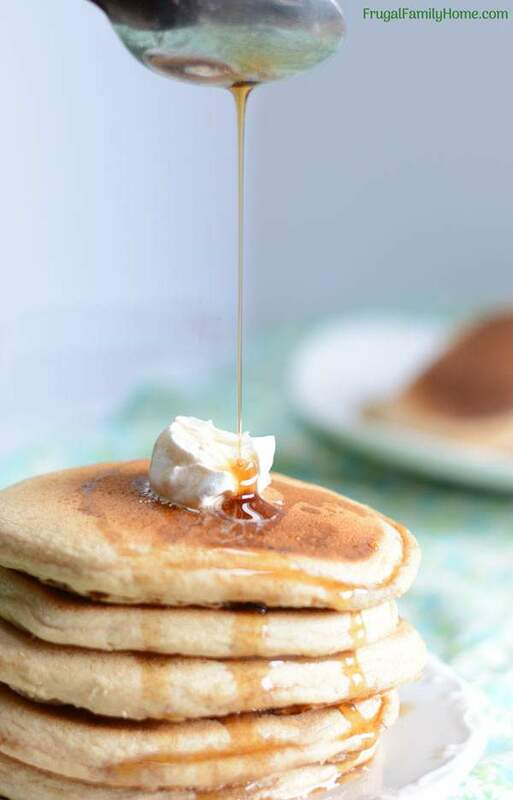 A few tips for you to make sure your pancakes turn out light and fluffy even though they are whole wheat pancakes. ✳︎ Use whole wheat pastry flour instead of whole wheat flour. It does make a difference. We like the Bob’s Red Mill brand because we can get it locally. You can also purchase it through Amazon. You can also find whole wheat pastry flour in the bulk food section at Winco Foods. ✳︎ Don’t over mix the batter. Only mix the batter until the dry ingredients are incorporated but they may still be lumps. The lumps are ok.
✳︎ Since these pancakes have no added fat to them, you may need to spray the pan with non-stick spray. I use my non-stick electric skillet which works great to cook them. 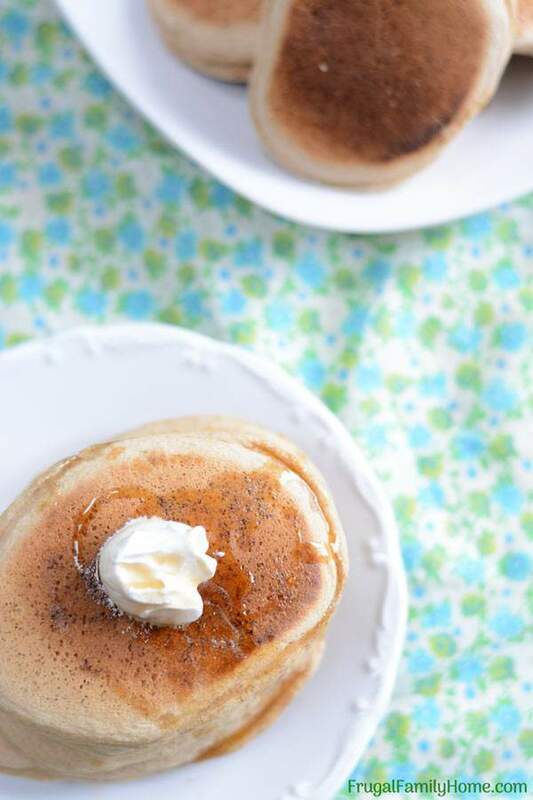 ✳︎ Serve the pancakes with homemade pancake syrup. One serving is 3 points more if you are using Weight Watcher SmartPoints system. You can also top them with fruit and a sprinkling of powdered sugar. Add the flour, sugar, salt, and baking powder to a bowl and whisk to mix well. To the flour mixture add the water, milk, and maple flavoring. Stir to combine. Heat a <g class="gr_ gr_114 gr-alert gr_spell gr_inline_cards gr_disable_anim_appear ContextualSpelling multiReplace" id="114" data-gr-id="114">non stick</g> skillet over <g class="gr_ gr_113 gr-alert gr_spell gr_inline_cards gr_disable_anim_appear ContextualSpelling ins-del multiReplace" id="113" data-gr-id="113">medium high</g> heat. Pour batter onto hot skillet, cook on one side until bubbles form. Flip and cook on <g class="gr_ gr_124 gr-alert gr_gramm gr_inline_cards gr_disable_anim_appear Grammar only-ins replaceWithoutSep" id="124" data-gr-id="124">second</g> side until golden brown. How Much Does a Batch of Easy Whole Wheat Pancakes Cost? It’s good to know how much recipes cost to make. You can decide if you can fit it into your grocery budget. The prices below are based on the prices I pay at Winco Foods. Your prices may vary according to where you live and shop, but at least it will give you an idea of the cost of this recipe. That brings the cost of the full recipe to $.72 and makes it $.18 per serving. Eating healthier doesn’t have to be hard, costly, or time consuming. 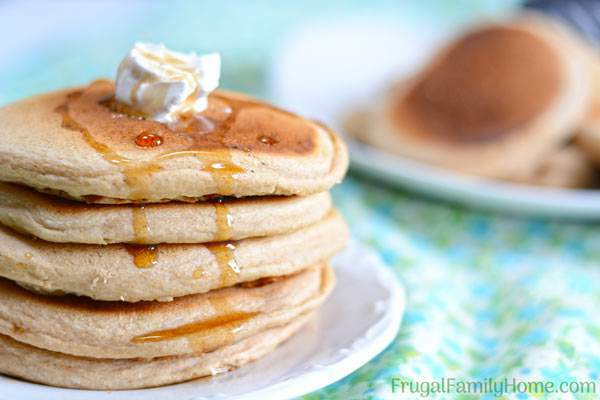 Recipes like these easy whole wheat pancakes can help you eat healthier on a budget. What your favorite healthy toppings for these whole wheat pancakes? This looks like a great recipe! I often shy away from using whole wheat flour in recipes, because everything turns out dry and heavy. I like your tip to use pastry flour! The pastry flour really does make a difference. I assume the salt is added in the dry ingredients with the baking powder and sugar? Jamie, yes that is correct. I’ve updated the recipe to include the salt. Thanks for asking.